For the final project, my group and I using the Circle of Courage framework and tying it into Social Emotional Learning (SEL) in our classrooms. This resource was great in introducing the four main principles of the Circle of Courage: Belonging, Mastery, Independence, and Generosity. For anyone who doesn’t know what the Circle of Courage is, it is a holistic program based on traditional Aboriginal ways of knowing, personal development, and community values. What differentiates this resource from other Circle of Courage resources I’ve posted is the section that talks about mending a broken spirit. 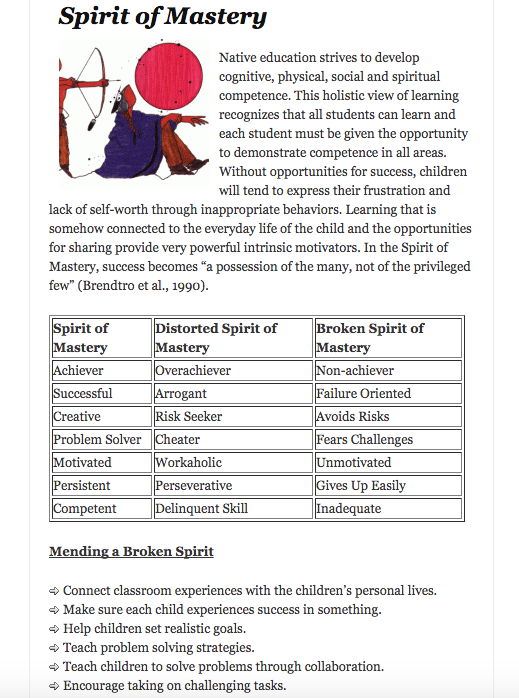 Below is a screenshot of the “mastery” lesson and the lesson on mending a broken spirit. Lastly, what I like about this resource is that different teachers are able to share their ideas on this blog. Collaborative learning allows for multiple perspectives to be taken into account, while providing a vast majority of ideas that can be implemented into lesson plans.